After twenty long days (well, for us anyway) our 16-month-old Weimaraner Stuka officially graduated from “Bird Camp” today and our pack is reunited. The additional week of training was beneficial and we noticed a marked evolution in his hunting skills. After the experience, one conclusion was clear; Stuka is developing his own unique style of hunting game birds. 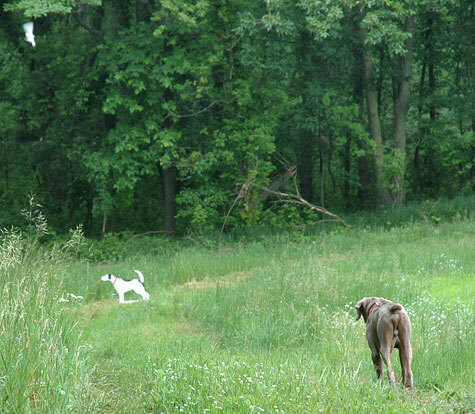 A clear difference between himself and my German Shorthaired Pointer (Elsa) is Stuka’s penchant for stalking his prey. But we’ll need to refine this trait and find balance between stalking and creeping too close to force a flush. Through the use of bird launchers, and experience on wild birds, he will begin to understand when to remain steady. But Stuka’s stalking prowess should prove useful when tracking wild pheasants who try run rather than flush. This past week brought on another distinct change in his hunting style. He’s gone from almost entirely nose down to hunting with his head up. He’s testing the wind, not just following a trail. While his nose will always be his strongest asset, he’s learning to add other tools to his hunting arsenal and with experience, he’ll figure out what works best, and when. I was pleased to see his progress in honoring other dogs’ points, even if the dog happened to be fake. 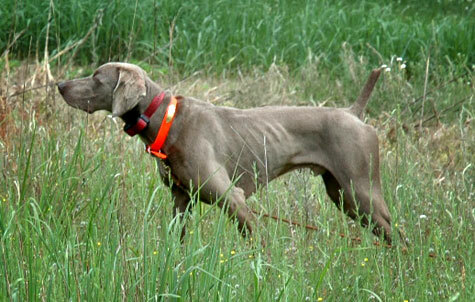 In the coming season Stuka and Elsa will have some controlled, simultaneous experiences in the field. Elsa’s stronger prey drive, larger area of ranging, and overall bird-finding experience may result in Stuka choosing to simply follow Elsa around. Stuka will spend time with her in the field, but we’ll watch that he doesn’t get lazy and let her find all the birds. He must also find his strengths and refine his own methodology. …the bird veers off to the right, and Stuka continues to hold steady. A memorable part of the day was seeing Stuka nail a solid point on a loose chukkar. Although the bird flushed weakly, only flying a few feet, fluttering in the grasses right in front of him, Stuka didn’t charge the bird. His point remained steady. The shotgun report didn’t faze Stuka, and he made a beautiful retrieve. With the bird in his mouth, he trotted right past Justin and I and headed straight for mom (who was operating the camera) and brought the bird to her hand. After seeing this, I suggested that perhaps Kay should start carrying a shotgun this fall, to which Justin commented that perhaps just a game vest will do.